It’s well-known that elephants never forget, but no creature has a longer memory than Akai the dolphin. Two years ago when I got into the water with him in Orlando’s Discovery Cove, he spat in my eye and then had the cheek to chuckle. When I went back this summer I was prepared to let bygones be bygones, but what did he do? Spat in my eye — after a mouthful of smelly sardines — and chuckled again. If a cork had come bobbing by I’d have bunged it in his breathing hole. Swimming with dolphins is just one of the thrill-filled experiences that make Orlando the complete holiday destination. A bit more daring is hitching a lift in a hang glider, sky diving without a parachute, kayaking in a creek that’s home to alligators and viewing fireworks from above in a light aircraft, but the main attractions that enticed 51.5 million visitors in 2010 are year-round sunshine and theme parks. Oh, and 12 mammoth shopping malls and outlet centres where you can buy a big suitcase and fill it with the latest designer gear for half the price it would cost at home, so don’t arrive in Orlando weighed down with luggage. And don’t go out pubbing or clubbing at night without your passport as many establishments won’t let you in without ID, no matter how over-21 you are or look. Even if you are turned away, it will be done with such charm that you’ll feel bad for having put the doorman to so much trouble. That’s typical of everyone who earns their livelihood from the hospitality sector — there are no Basil Fawltys in the world’s number one choice for family fun. Hotel, restaurant, bar, club and attractions staff comport themselves like graduates of the finest finishing schools, unlike some waiters and barmen I’ve met on my travels who’d be considered too nasty for the toughest reform schools. Orlando has 450 hotels with 114,000 guests rooms, 5,000 restaurants, 176 golf courses (Tiger Woods, Arnold Palmer and Ernie Ells live there), seven of the most popular theme parks in the world and a climate to fry for — the daily high from October to May is 27C/81F, and from June to September it hits 32C/90F. The 800,000 seniors from colder northern states and Canada who descend on Orlando for the winter know a good thing when they see it — who needs to endure four feet of snow when you can enjoy four months of sunshine? The tourism authority (www.visitorlando.com) reckons it would take 67 days to properly visit all the parks and more than 100 other attractions, and nearly five years to eat in all the restaurants if you went to three a day, but if you’re there for only a week there’s still an awful lot you can pack in without feeling you’re on a whirlwind tour. Talking of whirlwinds, when I was last there the tail end of a hurricane dumped several lakes’ worth of rain in one day, flipped a couple of Cessnas on to their backs at the airport and bent palm trees so much that their tops were whipping the ground. August through October is the height of the hurricane season, but it’s rare for Orlando to suffer any great damage, though your pride might be dented if you have to walk around the Walt Disney World Resort in a dripping wet Pluto plastic poncho. A few grey days aside, the sky is usually a beautiful holiday brochure blue, like all those swimming pools that can be seen dotting the landscape as your plane descends. But where’s the beach? It’s remarkable how many first-time visitors think Orlando’s by the seaside. It’s not: it’s 40 miles inland from the Atlantic and 60 miles from the Gulf of Mexico, which greatly weakens the hurricanes that cause such havoc in coastal communities. It also means there’s no chance of being eaten by a shark — the worst that can happen is a dolphin might spit in your eye, but that’s a small price to pay for being in holiday heaven. There is a sandy beach, albeit man-made, at Discovery Cove (www.discoverycove.com) where you can spend the day sunbathing, swimming with rays and colourful tropical fish, whizzing down water chutes, riding an inflatable tube around the Wind-Away River and interacting with Akai and his bottlenose buddies. Being an all-inclusive resort — daily visitor numbers are limited to around 1,000 so it never feels crowded — the entrance fee covers breakfast, lunch, snacks, drinks, smoothies and ice cream throughout the day, wetsuits and vests, snorkels and masks and activities depending on your chosen package. 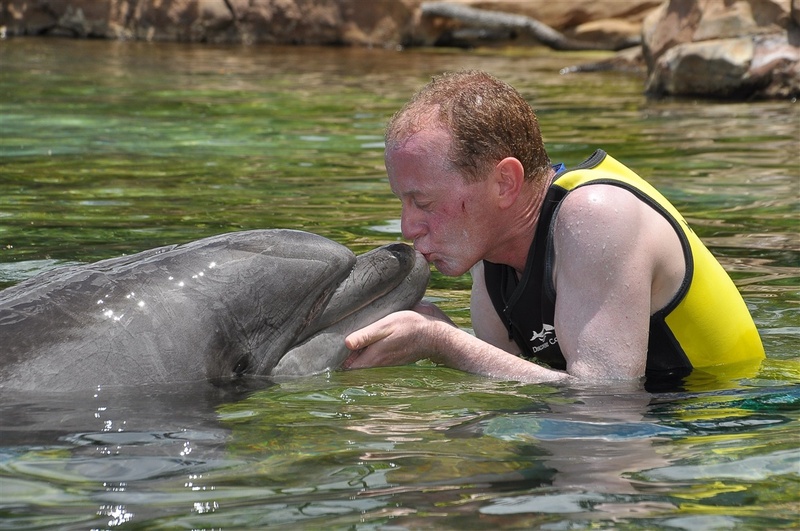 Whichever price plan you opt for, be sure to include the up-close-and-personal dolphin encounter or you’ll be denying yourself the thrill of a lifetime. It isn’t cheap, but it’s an experience you’ll cherish and be talking about for years. The most talked-about attraction of all, when you get your breath back, is the gasp-inducing Wizarding World of Harry Potter at the Universal Orlando Resort, and the most exciting ride on Earth is the Forbidden Journey deep within Hogwarts School of Witchcraft and Wizardry (I say exciting as opposed to scary — I’ll come to the theme park rollercoasters soon). Visit the animated website (www.universalorlando.com/harrypotter) and within seconds you’ll be itching to visit the real thing, where you step through an archway to be greeted by the conductor of the Hogwarts Express, probably the most photographed guy in Orlando after Mickey Mouse. And there it is behind him, a full-scale replica of engine 5972 that pulls the train between platform 9¾ at London King’s Cross and Hogsmeade. The moment you set eyes on that red and black steam locomotive, the snow-capped shops just beyond and the towering turrets of Hogwarts Castle in the distance, you’re transported into the magical world of JK Rowling’s seven books that have sold 450 million copies and the eight movies that have taken $7 billion at the worldwide box office. All the shops are open for business and do a roaring trade, which is inevitable given the huge numbers of visitors each day and all day. Fans can’t get enough of the merchandise on sale in Zonko’s joke shop, Honeydukes sweet shop, Ollivanders wands, Dervish and Banges for Quidditch gear and Hogwarts uniforms and scarves and Filch’s Emporium of Confiscated Goods where every imaginable type of Potter memento has spellbound Muggles spending money hand over fist. The magic words in the Wizarding World aren’t “Hey Presto!”, they’re “Cash or card?”, but you don’t save for a holiday in Orlando only to scrimp when you get there. Stocking up on souvenirs (do it on the way out to avoid carrying bags around) is hungry and thirsty work, so drop into the Three Broomsticks for some fish and chips, shepherd’s pie or mini Cornish pasties washed down with non-alcoholic butterbeer or pumpkin juice, or a more potent potion from the Hog’s Head pub through the back where dead-on-their-feet dads seek a sanity-saving break from shopping and gawping. You’ll either love or loathe butterbeer, a caramel-coloured sugar-rush that tastes of butterscotch and shortbread and comes in liquid and slushy varieties, but go easy with the latter — too big a gulp and you’ll get brain freeze. If you’re prone to seasickness, eat and drink after your five-minute Forbidden Journey ride. It’s not a rollercoaster, it’s what’s called a dark ride robocoaster where the seats, or “enchanted benches”, are held above the track by a robotic arm. There are no loop-the-loops or high-speed corkscrew manoeuvres, nothing upside down and no face-contorting G-forces to contend with; however, this amazing mix of audio animatronics and wrap-around projection screens does involve unexpected drops, spins, twists and backward tipping and reaches 23mph/37kph as riders fly through a Floo Network following Harry and Ron Weasley on their broomsticks into the action of a Quidditch match. There are also close encounters with a fire-breathing dragon, a venom-spitting acromantula, a flailing Whomping Willow, Dementors and collapsing cliffs, with accompanying dramatic music and sound effects plus the screams of riders. Be aware, though, that unless you join the Forbidden Journey queue before 9am or after 5pm, you’re in for a lengthy wait — upwards of 2½ hours at peak times — before your backside touches one of those enchanted benches, but believe me, it’s worth it. Just make sure you have plenty of water with you or you’ll faint before you get the chance to fly. I was flying — and silently praying — when I went tandem hang-gliding at Wallaby Ranch (www.wallabyranch.com) after being towed along the ground and 2,000 feet into the air by a guy piloting what appeared to be a propeller-powered bedstead masquerading as a plane. The knuckles of a corpse in the advanced stages of rigor mortis couldn’t have been tighter than mine as I clung to the forward crossbar for dear life, especially when the towrope was released. But then, as the hang-glider wobbled a bit and steadied, all was peaceful and calm and silent, except for the whoosh of the wind in my ears as we rode the thermals, soaring and swooping, and I relaxed my grip and enjoyed the views. For 10 minutes we rose and fell, dipped and dived, and then I got to wondering — how the hell do we get down from here? But I needn’t have worried. When the wheels on the hang-glider tickled the ground after a gentle descent, it was like landing in a field coated with marshmallows. In stark contrast to my airborne adventure, kayaking in Shingle Creek (www.grandelakes.com/Eco-Tours-115.html), a three-minute golf buggy ride from the JW Marriott Grande Lakes Hotel where I stayed on both my visits to Orlando, was two hours of head-cleansing tranquillity. Until, that is, expedition leader, scientist and wise guy Carlos pointed to the riverbank a few feet from me and casually remarked: “Oh, look, there’s an alligator.” Never has a kayak been paddled in such a panic or so quickly. I went skimming across the surface of that creek faster than a torpedo with my arms going like a windmill in a gale and Carlos laughing his head off — the man-eater I’d imagined turned out to be a two-foot long baby. That’s all very well, but two-foot long babies have 13-foot long mothers which weigh up to 800 pounds, and I wasn’t going to hang around for an introduction. Scaredy-cat moment aside, being up the creek with a paddle and under the safe supervision of Carlos was probably the most carefree and relaxing way of spending a morning before setting out for a day in the theme parks. Universal Orlando Resort’s Islands of Adventure (www.universalorlando.com) is home to the Hollywood Rip Ride Rockit, a rollercoaster with speakers in the headrests that let you listen to a soundtrack of your choice as you shoot around the track at 65mph. At 17 storeys high this is Orlando’s tallest coaster. It includes a 167-foot vertical lift and is very scary indeed — the last time I saw so many people blessing themselves I was in Saint Peter’s Square. The Amazing Adventures of Spider-Man, in which riders follow Spidey as he chases a gang who’ve stolen the Statue of Liberty, is widely regarded as setting the standard in 3D filmed images. The simulated 400-foot freefall leaves faces white with fright. Jump aboard the hilarious Simpsons Ride and enjoy a simulated rollercoaster tour of Springfield and Krustyland projected in quadruple high definition on an 80-foot diameter dome. As you might expect, Krusty the Clown’s budget for maintaining his creaking attractions is non-existent, so riders are in for a destructive journey in the company of Homer, Marge, Bart, Lisa, Maggie and many other favourite characters. The Incredible Hulk Coaster takes off with the same force as a Top Gun fighter jet leaving an aircraft carrier, going from 0 to 40mph in just two seconds and reaching 67mph as it careers through loops and bends for 2¼ terrifying minutes. Not for the faint-hearted. 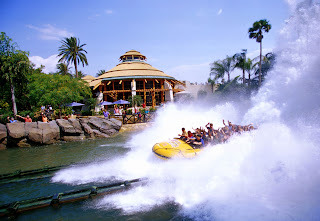 If a go on the Incredible Hulk hasn’t dampened your appetite for thrills and spills, the Jurassic Park River Adventure’s 85-foot plunge — like going over the Niagara Falls — will leave you drenched, but after 10 minutes of walking around in the sunshine your clothes will be dry again. From getting a ducking we move on to diving, or rather floating, in a vertical wind tunnel at iFly Orlando (www.iflyorlando.com), which is a must-do experience. 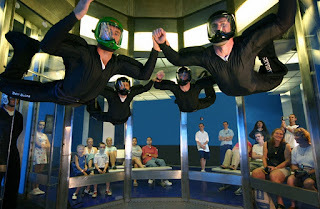 There’s no need to pull on a parachute and jump from a plane, just lean forward and you’ll be riding a column of air from giant fans beneath the grille in the floor. You’ll be up and down like a fiddler’s elbow to start with, but once you get the hang of it with the help of an instructor, indoor skydiving is easy-peasy. Unless, that is, you’re like me. I did more falling than flying, which resulted in some pretty spectacular handstands, but at least the kids watching through the glass walls got a laugh. It’s best to make a reservation as this is so popular that turning up on spec might result in a long wait or disappointment. Another air-raising experience I’d recommend is seeing fireworks from above — well above and out of range — or getting a daytime bird’s eye view of the theme parks from a light aircraft with Mauiva Air Tours (www.mauivaairtours.com). I took the nightly fireworks flight out of Kissimmee airport with baby-faced pilot Blake Taylor who on landing said I was the quietest passenger he’d ever had. He’d been chatting away for 30 minutes, pointing out all the illuminated landmarks, and wondered why I hadn’t responded. When I told him I hadn’t heard a word, he realised he hadn’t switched my headphones on, but I’m sure it was a fascinating commentary. 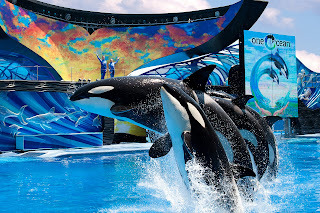 One of the major highlights of a holiday in Orlando is seeing the performing killer whales during a day out at the out-of-this-world SeaWorld (www.seaworldparks.com). The Shamu Show, One Ocean has adults and children alike whooping with delight, especially when those sitting closest to the pool get a soaking when these black and white giants of the sea send a tidal wave of water over them. However, as mentioned above, the heat of the sun ensures that those who get drenched are dry again before they know it. Apart from being a venue for fabulous family entertainment, SeaWorld is a world leader in the conservation of endangered marine creatures, especially the curious, unimaginably slow-moving manatee which at first sight appears to be part walrus, part lava lamp and is native to Florida’s sub-tropical waters, the Caribbean, the Gulf of Mexico, the Amazon Basin and West Africa. Looking at it in its SeaWorld pond where no one can harm it, it’s a big blob of blubber that only a mother manatee could love. However, in the wild these placid animals which feed for up to eight hours a day and rest for up to 12 have been hunted for their meat and had their habitats destroyed. Cinderella’s Castle is the dreamy, iconic image imprinted on everyone’s mind when the Walt Disney World Magic Kingdom Park (http://www.disneyworld.disney.go.com/) is mentioned. This fairytale fortress surrounded by a sparkling moat has children staring in wide-eyed wonder at its soaring turrets and spires, and who knows what medieval adventures involving jousting knights and beautiful princesses fill their little heads? Fans of TV talent shows will love American Idol Experience and, with a bit of luck, could take the first steps towards a glittering music career by stepping on stage and impressing the judges in front of a supportive audience of fellow holidaymakers who get to vote for their favourite acts. Continuing the music theme, the 60mph indoor Rock ’n’ Rollercoaster with blaring hits from Aerosmith as you shoot around the track in a stylised stretch limo is one of the best rides in Orlando and for many the highlight of a visit to Disney Hollywood Studios. Here also you’d be mad to miss a go on the frightening freight elevator in the Twilight Zone Tower of Terror, which rises to the 13th floor before falling down the shaft, rising again and, without warning, plunging once more — real heart-in-mouth stuff. The Disney highlight for me, though, was a tour of the 500-acre Animal Kingdom Park which is home to 1,700 animals from 250 species. Having never been on a real safari, this was the next best thing, being driven around in an open-sided truck while viewing giraffes, hippos, elephants, lions and gorillas. If you’re visiting Orlando with small children, Disney is unbeatable, but for teenagers and adults, Universal is the place to go. 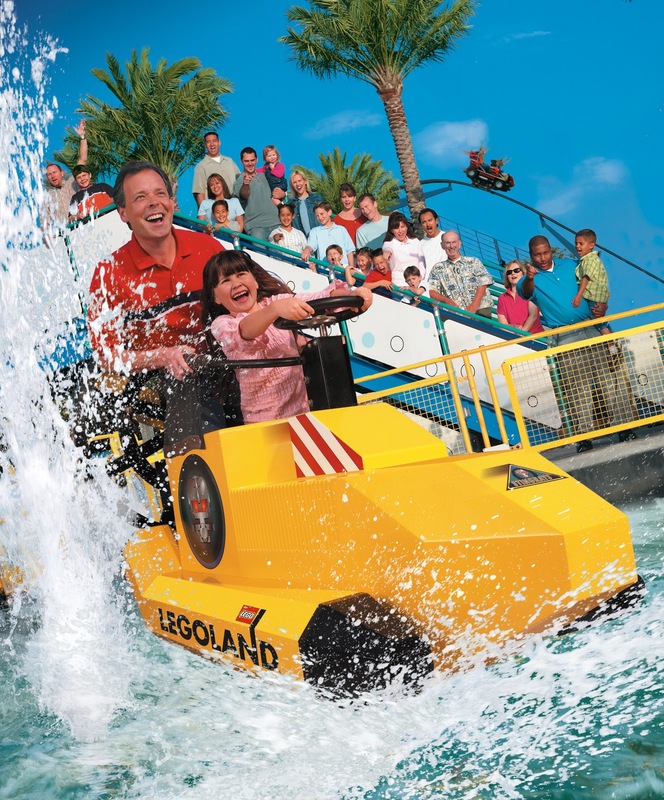 SeaWorld and Discovery Cove will be enjoyed by visitors of all ages. Every Thursday year-round is Christmas Day in Give Kids the World Village, because many of the small children and teenagers who spend a cost-free week in this 140-villa resort with their families have life-threatening illnesses that mean they may not live to see their next Christmas. Away from the fun and frolics of the parks, a morning’s voluntary stint serving breakfast there was a humbling, heart-rending and overwhelming experience. The story that moved me to tears was that of a five-year-old boy suffering from leukaemia whose dearest wish was to see his parents married in the village’s beautiful little chapel. The good people at GKTW who since 1986 have hosted 100,000 families from throughout the USA and 72 countries worldwide made it happen for him. A few days after watching his parents exchange their vows and with his dream realised, he passed away. It costs $12 million a year to run the non-profit Give Kids the World and put smiles on the faces of dying children. If you’d like to volunteer a little of your holiday time while in Orlando or make a donation, see www.gktw.org. As I said, I’ve stayed twice at the family-friendly, 1,000-room JW Marriott Orlando Grande Lakes (www.grandelakes.com), and if I’m lucky enough to visit Orlando again and have the choice I wouldn’t bunk down anywhere else. It’s only 15 minutes from the airport and the main theme parks, so it’s the ideal base. Guests enjoy full use of the spa with 40 treatment rooms and fitness centre in the adjoining Ritz-Carlton Hotel, and there’s a Greg Norman-designed championship golf course next door. On-site lunch and dinner options include Italian restaurant Primo, the Citron brasserie, the Quench poolside bar and grill, a sushi bar, Cafe Bodega and a Starbucks, while in the Ritz-Carlton there’s the Vineyard Grill steakhouse, the acclaimed and classy Norman’s offering New World Cuisine and the Bleu poolside restaurant. 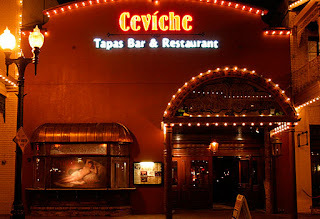 I was delighted to see the menu in Galician restaurant Ceviche (www.ceviche.com) in downtown Orlando featured many of my favourite Spanish dishes, so I tucked into squid, octopus, hake, patatas bravas and several other tasty treats like a man who hadn’t eaten for days. More than 100 hot and cold tapas are on offer, as well as paella and cazuelas. The champagne sangria is amazing. The atmosphere in Crave (www.craveamerica.com), close to the Mall at Millennia, is chic yet casual, and the sushi has won a string of awards, as has the wine list. If you like steak you’ll love the grilled rib eye with Yukon mashed potatoes, tempura onions, blue cheese and red wine reduction. Forget about cutlery, but grab a bib, in Bubba Gump Shrimp Co (www.bubbagump.com) in Universal Orlando’s CityWalk and get stuck in with your fingers. Mountains of baby back ribs and shrimp are the staples. Amura (www.amura.com) operates three Japanese restaurants in Orlando, each as good as the others and all regular winners of best-this and best-that awards. There simply aren’t enough superlatives to describe how good the food is, so you’ll have to take my word that they’re all three-mendous. Sweet Tomatoes (www.souplantation.com), at Lake Buena Vista and several other Orlando locations, is a grab-a-tray, help-yourself, all-you-can-eat restaurant chain where the locals go to fill up. It’s cheap and cheerful and, as our French friends might say, tray bien. ˜See www.visitorlando.com where you’ll find an itinerary-building tool offering holiday ideas and the facility to buy attraction tickets. See also www.americanholidays.com or call Dublin 01 673 3840, Cork 021 236 4636 or Belfast 02890 511840.